Elon Musk's dream of creating a superfast new transportation system got a step closer to reality over the weekend. On Saturday (Jan. 30), a team from the Massachusetts Institute of Technology (MIT) won the first stage of the SpaceX Hyperloop design competition, which was held at Texas A&M University in College Station. "MIT has been involved in so many technological breakthroughs in the past century," team captain Philippe Kirschen, a master's student in aeronautics and astronautics, said in a statement. "It just makes sense we would help advance what might be the future of transportation." Some members of the MIT team, which submitted the winning pod design for the SpaceX Hyperloop design contest in January 2016. Musk — the CEO of private spaceflight company SpaceX and electric-car company Tesla Motors — announced his vision for the Hyperloop in a 2013 white paper. 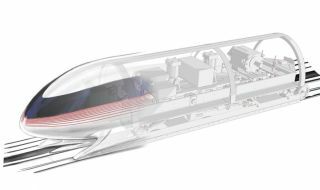 The system would use pods, traveling in tubes in a near-vacuum, to move people between big cities that are no more than 900 miles (1,500 kilometers) apart, such as San Francisco and Los Angeles. The pods would levitate above the ground. They would therefore encounter very little friction, and could zoom along at nearly the speed of sound (about 767 mph, or 1,234 km/h, at sea level), according to Musk. Musk envisioned using a cushion of air to achieve levitation, but the MIT team decided to go with magnets above a conducting plate. The aluminum test track that SpaceX is already building near its headquarters will serve as this conducting plate, MIT team members said. "The beauty of the system we designed is that it's completely passive, an elegant property that will make our pod very scalable," Kirschen added. The MIT team's prototype Hyperloop pod will be about 8.2 feet (2.5 meters) long by 3.3 feet (1 m) wide and weigh 550 lbs. (250 kilograms), with the aerodynamic feel of a bobsled, Kirschen said. The vehicle will be built to accommodate a mechanical pusher (which will provide propulsion) as well as a variety of sensors, university officials said. The MIT team will need to finish final assembly of its pod by mid-May. The students will aim to achieve a speed of at least 225 mph (362 km/h) during the vehicle's 20-second inaugural run, which will not include carrying any passengers.